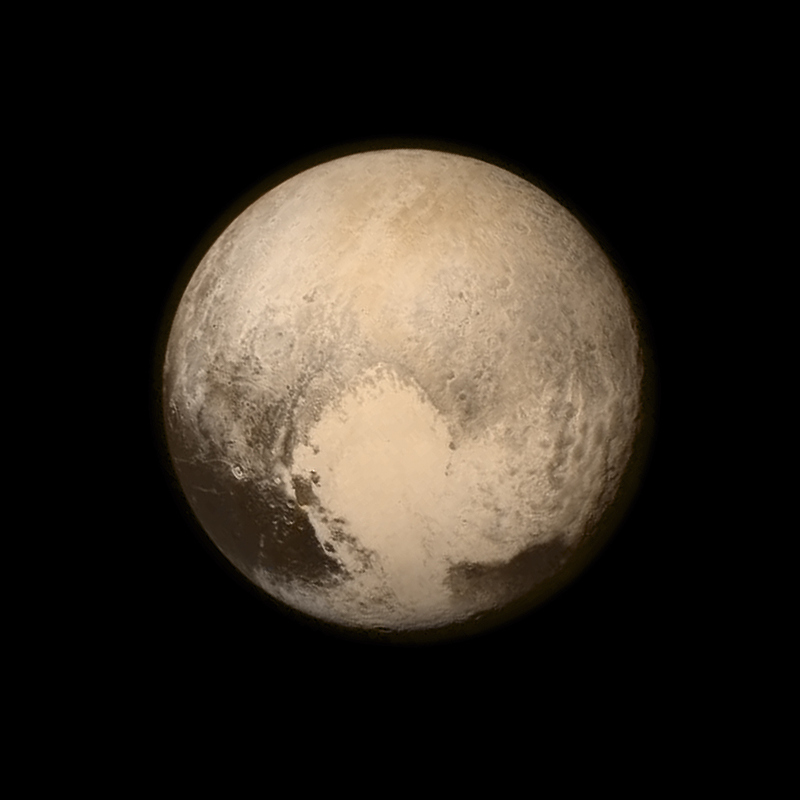 Hello from Earth, Pluto! NASA has just released the first ever close-up shots of the on-again-off-again ninth planet in our solar system. (Pluto's official planetary status is still "dwarf planet." Sorry!) These brand new up-close photos of Pluto have just been released by NASA, and they are breathtaking. The spacecraft responsible for these fantastic new photos is the New Horizons. According to the craft's Twitter page (yep, spacecrafts are on social media, too), New Horizons was launched all the way back in 2006, and made its epic approach towards Pluto and its moons over the last several days. NASA scientists are already learning quite a lot about Pluto and its moons from New Horizons. To the untrained eye (i.e. my own eye), these pictures just look really cool. But NASA has reported that they reveal a lot of new discoveries. Among the new findings are icy mountains and that Pluto may have one of the youngest planetary surfaces in our solar system. If normal pictures are worth a thousand words, these have got to be worth at least 10,000 to the NASA community. Alan Stern, principal investigator of New Horizons, has called this mission's findings a "home run." You know that if scientists are using sports metaphors, it's because there's something to be really excited about. So let's take a look at the transformation Pluto has made from a blurry blob that we didn't even want to call a planet to intergalactic celebrity. Blurry blob --> most lovable dwarf planet ever. This is a shot of some of Plutos's icy mountains. They look cold. NASA tweeted this photo to provide some context for those mountains we saw above. Pluto's largest moon, Charon, is a beaut. Kind of looks like our moon, doesn't it? NASA exaggerated the colors in this photo of Pluto and Charon in order to illustrate their different surface materials. Each color signifies a different material. Cool! This photo of one of Pluto's other moons, Hydra, is pixelated as hell, but NASA said it still provides important information about the shape of the moon. Imaging has also revealed that there is "an abundance" of methane ice in various quantities across Pluto's surface. Remember what I said about excited scientists? Awww, we love you, too, Pluto!